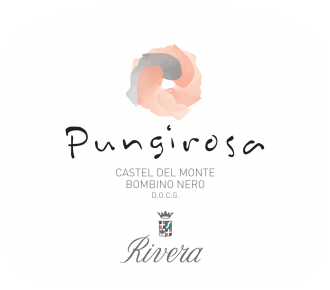 This wine has made the history of Italian rosé and it is Rivera’s pride and joy. It is obtained mainly from Bombino Nero, a grape variety that is grown exclusively on the rocky hills of the DOC Castel del Monte. After a soft crushing, the grapes stay in the soak for 22-24 hours to take of from skins the right color and aroma that will give the characteristics and uniqueness that make this wine so famous. Aged in stainless steel for 3-4 months before release. Rivera Rose’ Pungirosa has a light cherry hue. A fruit-rich bouquet with notes of rose, cherry and strawberry. Lovely and easygoing, a remarkably smooth rosato that finishes long, clean and with persistent floral notes. Very enjoyable as an aperitif and a perfect match to seafood appetizers, light soups and pasta dishes, baked fish, poultry and veal. Serve well chilled. Bombino Nero is a red grape varietal grown exclusively on the Murgia hills of the Castel del Monte area. It is not suitable to producing full red wines because of its thin skin, uneven ripening of the bunches, and the grape’s high juice content. However, it produces lovely rose’ wines, very fresh and fruity. this unique grape allows the winemaker to vinify the natural free-run juice, without pressing. 25-30 year old head-trained vineyard, planted on rocky soils at an altitude of 320 meters a.s.l. Yield is 100-110 quintals per hectare. Harvest takes place during the first week of October. The skins are kept in contact with the juice for 22-24 hours at 5-6°C in stainless steel vats in order to extract only the most delicate aromas. The must is then drained off without pressing and the fermentation continues for 12-14 days at 18-20°C. In stainless steel for 3-4 months, then bottled and released.